Registration is now open for the Association of the Nonwoven Fabrics Industry’s (INDA’s) show IDEA®2019 to be held in Miami Beach, Fla., March 25-28, 2019. Visit idea2019.com to sign up. Tarkett’s Velvet Fringe carpet is available in 12-foot widths. 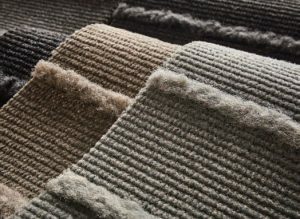 Tarkett, Solon, Ohio, has launched the Woven Fringe Collection featuring two woven velvet cut-and-loop solution-dyed nylon carpet styles — Velvet Lines and Velvet Fringe — that have lines of long, uncut face fiber, or fringe, across the weft. Dalton, Ga.-based Shaw Industries reports it was named one of “The Best Employers for Diversity,” by Forbes Magazine. to be a team in 2019. The Lubrizol Corp., Cleveland, has named Osterman and Co. Inc., Cheshire, Conn., a distributor of its thermoplastic polyurethane (TPU) portfolio including Estane® TPU polymers, Pearlthane™ TPU, and Pearlthane ECO* TPU. Osterman joins Entec as a U.S.-based representative of Lubrizol’s Estane products. Cincinnati-based Cintas Corp. has partnered with JW Marriott, part of Marriott International Inc., to launch an apparel collection available at 51 of the brand’s hotels worldwide. In addition, Cintas will manage a garment recycling program to responsibly reuse retired JW Marriott uniforms from U.S.-based properties. Mara Hoffman was awarded the REPREVE® Champions of Sustainability Leading the Change Award at an exclusive reception during New York Fashion week. The award, presented by Greensboro, N.C.-based Unifi Inc., recognizes the brand’s longtime commitment to reducing environmental impact through conscious fashion.